First there were iconic individual restaurants..
You remember Khyber, Copper Chimney, China Garden, Little Italy and many more of such type. Far some of these may have been, but we’d drive down on the Saturday evenings, wait in queue, but ensure that we get a table and enjoy the great fare they’d serve. And suddenly we had many Copper Chimneys. And we were tempted to go to the ‘nearest’ Copper Chimney. Unfortunately, not every F&B brand can do franchising like McDonald’s does. With the result that the different outlets would not have consistency. So you start missing the ‘real’ Copper Chimney, for example. But by now, the brand has given you a disappointment, and now you are not so sure, if you want to take the trouble to go all the way to the ‘original’ Copper Chimney. Also you have a doubt whether the quality is down for the brand itself, since you did eat from a Copper Chimney itself, didn’t you?! Well, if this was not enough to damage the brand, we now have the Food-Courting of good F&B brands! The temptation of those huge spaces in the malls, where there are thousands of footfalls, got these branded restaurants to open cubby hole spaces in the food courts as well. Well know and very popular restaurant brands like Little Italy, Swati Snacks and others have started opening these mini-outlets in the food courts of malls. In most cases, they are unable to live up to the overall quality or experience standards associated with their original branded outlets. I have personally had very disappointing experiences with both, Little Italy (at K Star Mall in Chembur) and Swati Snacks (at Oberoi Mall in Goregaon). Food quality, service levels and apathy on the part of the people on the counter were the main reasons for feeling bad! So what happens? The goodwill that the brands built painstakingly over the years, is damaged, due to being unable to maintain those standards, perhaps constrained by the format of the food courts. Why then, do these brands still get to the food courts? Are they not killing the golden goose in the process? Having been exposed to both sides of the coin I empathise with you as am able to relate to your experience with food courts and the resultant dissatifcaction. Prima facie, I too held a similar notion. However, on letting the thought process run it’s course, I realised that it was I who was mistaken in expecting the same experience as I would get from a popular sit-down restaurant from it’s food-court format variant. I realised that being a different format it is just not geared to deliver the same experience and nor is it intended to. However I’m glad that the proliferation of such ‘cubbyholes’ bring some of the USP’s of these great restaurants much closer to us. Greater reach for the brand and greater accessibility to patrons. I see it as more of a win-win situation than any other. I see no harm in restaurants building on the brand equity they may have painstakingly cultivated and wishing to explore formats other than their original ones and trying to reach a wider audience. To draw an analogy, in railways one has the option to choose A/C – Non A/C, 1st Class, Sleeper Class, etc. While the company delivering the experience and the journey remain the same the experience varies depending on which class one choses to pay for and travel in. Yet all these classes exist since the market segments exist to which these classes are suited to cater. We, having lived in India have become accustomed to the expectations linked to each of these classes, which we take for granted, and hence are rarely disappointed with the choice we make when we travel. However, an international traveler would be unaccustomed to and hence probably be disappointed with the state of the affairs in the general compartment. This dissonance between expectations and delivery is the primary cause of dissatisfaction. The dissonance is in the expectations one has from these abbreviated formats. No matter however the brands may have tried to differentiate the positioning via. use of visual schemes, naming, pricing, packaging, etc. if one still expects the same experience as a full blown restaurant one is bound to be disappointed. 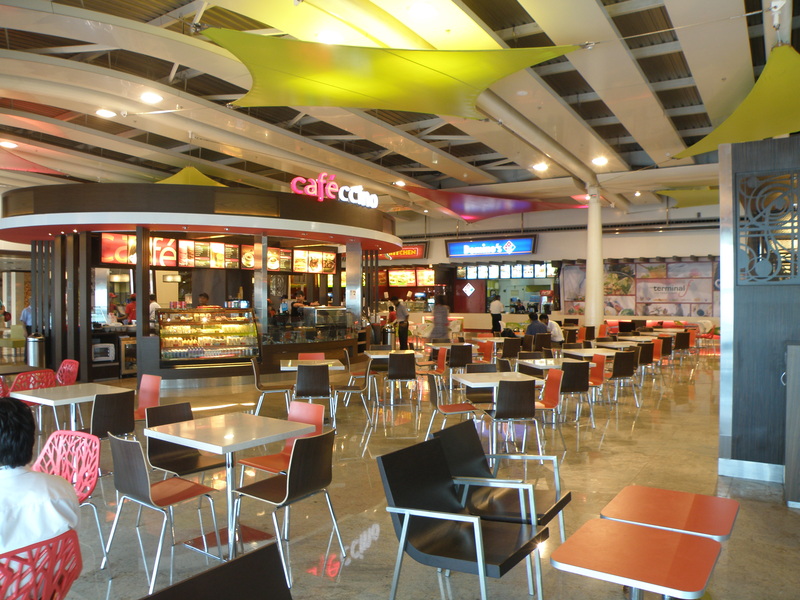 What food courts also offer is variety. So while I may relish the Copper Chimney ‘Choley Bhature’ my souse may not, she may prefer the Kailash Parbat ‘Chaats & Chass’, the kids may be happier with Burgers & Pizzas while my parents may prefer Dosas & Idlis. All these are available under the same roof in a food court, so everyone has a happy dining experience after the customary romp to the multiplex or a quick visit to the hypermarket. For the absolutely perfect experience there is always the option to take the pilgrimage to the ‘good ole’ that one could always make when one has the time and the inclination to. But why not embellish that shopping experience by stopping at your popular brand’s kiosk in the food court at the mall and grab a bite of your favourite’s quick service version. Thanks for taking the effort to put this detailed note. But I disagree. Like a consumer, I formed a view. I took the effort to pen it here, and you gave me a view point about it. Most consumers will not pen it down, just remain disappointed and disturbed. Maybe it is their expectation mismatch or whatever.. but who is the loser?? The brand! While the brand may want to exploit an opportunity presented by food courts, and it is fine to do so, however, it cannot be done, by using the same brand name in the same form, where a certain experience is then expected! There are many brands which have different variants, especially in the western world. These are usually slightly differently branded, e.g. Brand ABC, then Brand ABC-Express, or Brand ABC-Takeaway Only etc. This is to highlight the different experience that a consumer can expect, in that case. In India, the F&B brands have not chosen this path, and create an expectation of the “same Copper Chimney” or the “same Swati Snacks” and which eventually leads to disappointment. Moreover, especially for a food brand, there is no excuse to not serve the same kind or quality of food. Be it food court or whatever, if you have a Swati Snacks brand out there, and you serve them something that does not deserve to be called Swati Snacks, you are destroying your brand. Period. So if you want me to travel I AC, or I, or II AC etc, you need to TELL ME clearly that difference. Because one is located in one place and another elsewhere does not give me, the consumer, an automatic understanding of the difference! Cafe Coffee Day seems to have pulled this off really well. They have the premium Cafe Coffee Day Square/Lounge (I dont know about Mumbai, but the Square in Bangalore has an average price for a coffee at around Rs. 300), and the normal cafes and then there are the Xpress outlets. Exactly, if the brand manages to create and show the distinction, and thereby creates different set of expectations, then it works fine. I am not so much aware of CCD, but am definitely aware of the upmarket Lavassa lounges as against the typical Barista ones. They brand those as Lavassa instead of Barista and also the look and feel, the ambience, the range on the menu (and the prices of course) show that it is different from the typical Barista outlets. Now you can tamper your expectations differently. NOT when it is Copper Chimney or Little Italy or Swati Snacks everywhere, and the experience is very different each time!